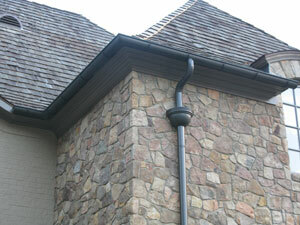 Gutters are one of the most important features to the overall protection of the exterior of your home. They do the job of moving water from the roof to and away from the base of your home. ASM installs standard 5” gutters for small residential houses, oversize 6” gutters for larger custom homes and 8” gutters for the larger commercial jobs. All gutters are available in conventional k-style/historical half round and aluminum and copper. We also offer copper gutters. Nothing can make a house more dramatic than copper gutters. Continuous copper gutters are a beautiful addition to any home or office building. These gutters are also available in seamless k-style and seamless half round. Copper gutters are the longest lasting gutters. They will not rust and will weather naturally to a beautiful green patina color.